The goal of Magical Peony Nursery is to provide better and stronger peony crowns to commercial nurseries and farmers worldwide. We purchase bare root crowns from various suppliers worldwide. These are divided into 3-5 buds per plant. They are then planted in 3 liters pots containing sterile perlite. Growth proceeds under tight supervision for 9-11 months. 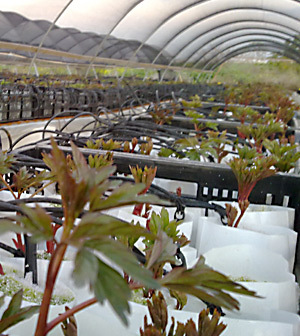 The plants with multiple buds and live young roots are then ready to be packaged and shipped. Our plants do not need "cooking" due to the sterility of the perlite substrate. The absence of pesticides ensures that our plants are supplied with minimal diseases and insect-free. more young, live roots which enroot faster. We also produce and market cut peony flowers for export between January and April, achieved by artificial cooling of our 10-25 Liter buckets containing perlite.